As Feds leave the rates unchanged, it supported JPY. USDJPY is affected by economic data such as BOJ Press Conference and Monetary Policy Statement in Japan and the Natural Gas Storage, NAHB Housing Market Index, Current Account, Unemployment Claims, Philly Fed Manufacturing Index, Core CPI m/m, and CPI m/m in the US. 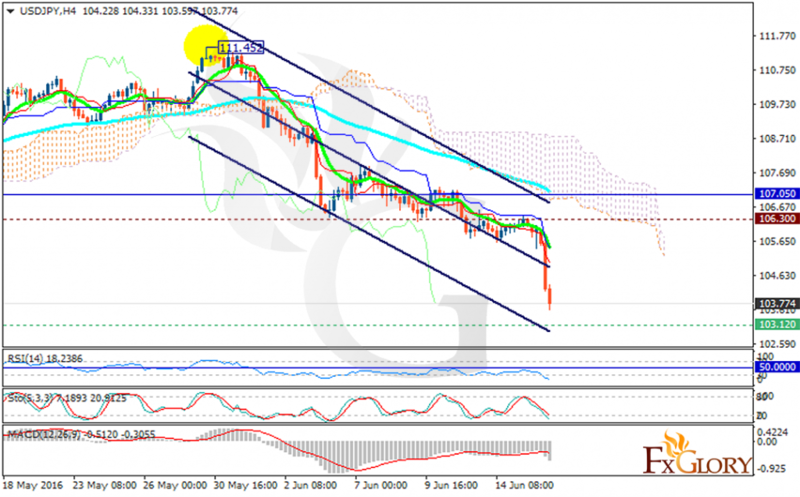 USDJPY is falling sharply; the support lies at 103.120 with resistance at 106.300 which both lines are below the weekly pivot point at 107.050. The EMA of 10 is falling down the descendant channel as well and it is located below the EMA of 75. The price is under the Ichimoku Cloud and the Chinkou Span. The Tenkan-sen and the Kijun-sen are both showing price fall. Moreover, the MACD indicator is in negative territory, the RSI is below the oversold area and the Stochastic is showing price decline. Short positions are recommended with the target at 103.40.